Create and share itineraries with other travelers, save the forest from an evil factory, and access your computer remotely with today’s collection of apps and games. Splashtop 2 Remote Desktop for iPhone & iPod – Personal ($2.99 → Free, 42.9 MB): Access your Mac or PC remotely from your iPhone or iPod touch with this business app. It’s perfect for those who want to operate and utilize computer apps and files on their iDevices. 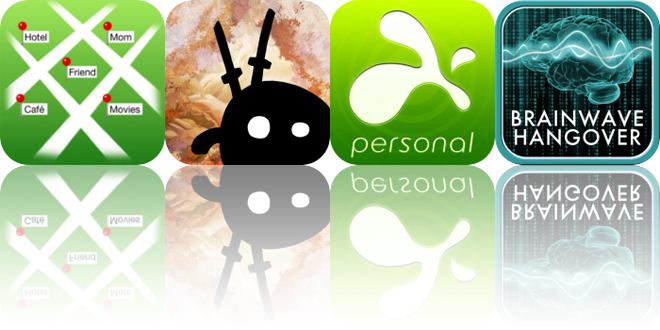 Splashtop 2 Remote Desktop for iPhone & iPod – Personal is available for free for a limited time. It has a 4.5-star rating with a total of 2560 ratings. Shadow Bug ($3.99 → Free, 234.8 MB): Save the forest from an evil factory in Shadow Bug. It’s for fans of games like Badland. Armed with only his katanas, Shadow Bug must overcome an endless stream of monsters and take the forest back. You’re able to move by tapping on either side of the screen. Tap on an enemy to fly through the air and slice them to bits. Each level requires you to move quickly, solve puzzles, and dispose of as many enemies as possible in order to earn a perfect rating. Shadow Bug is available for free for a limited time. It has a 5-star rating with a total of 48 ratings. Camtinerary ($1.99 → Free, 40.6 MB): Create and share itineraries with other travelers with Camtinerary. It’s for the frequent traveler. Camtinerary is available for free for a limited time. It has a 4.5-star rating with a total of 12 ratings. BrainWave Hangover Relief – Advanced Binaural Brainwave Entrainment ($0.99 → Free, 88.2 MB): Relieve hangover symptoms by listening to low frequency waves with this health app. It provides a great way to relax your mind. BrainWave Hangover Relief offers advanced brainwave entrainment therapy. You’re able to select from daytime and evening programs, and choose a soothing background sound to accompany them. Then hit play and allow the app to sync your brainwaves to the deeply relaxing low frequency alpha and theta waves. The app also allows you to adjust the signal intensity and save your settings for later use. BrainWave Hangover Relief – Advanced Binaural Brainwave Entrainment is available for free for a limited time. It has a 3.5-star rating with a total of 41 ratings. Splashtop 2 Remote Desktop – Personal ($4.99 → Free, 58.8 MB): Access your Mac or PC remotely from your iiPad with this business app. It’s perfect for those who want to operate and utilize computer apps and files on their iDevices. Splashtop 2 Remote Desktop – Personal is available for free for a limited time. It has a 4.5-star rating with a total of 29171 ratings.